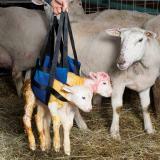 Premier's extra-tough option to carry or weigh lambs or goat kids. 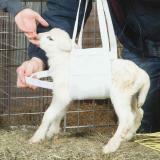 Adjustable chest support strap allows slings to be used for all sizes of lambs and goat kids. Strong and soft polyester mesh provides comfort during transport or weighing. To weigh them, use the Digital Scale. 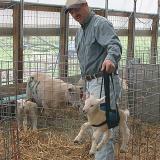 Key advantage is that the ewe or doe can see, hear and most importantly smell them and more readily follows. This is vital for preserving the mother/offspring bond. 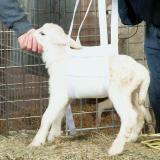 Less human smell on newborns reduces risk of abandoned lamb(s) and goat kid(s). Place mesh under newborn's belly. Pull handles up on both sides of the animal. Adjust the Velcro chest strap to fit the animal. 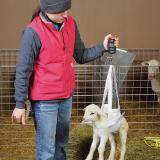 Make sure animal is centered in the sling. 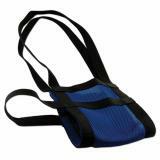 If they start to slide re-adjust sling. 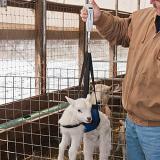 Heavy duty metal scale for weighing newborn lambs and kids. Recommended: 23 out of 28 said they would recommend this product to a friend. It does what I need it to and is inexpensive enough to keep it. I wish I was able to select the color - they sent me white and after just a couple weeks it's already filthy from dirty little hooves. Worked great first week or so while the kids didn't try to squirm out, but after that they either slid backwards or slid forward and choked themselves, so I had to weigh them quickly. Probably wouldn't buy this model again. I want to like this. And I suppose for smaller kids, I do. However, once they get a bit of length on them, at about 2 weeks for my kids, it becomes a struggle to keep them from sliding out backwards. I have adjusted the strap to try to make it more secure, but it's not been very successful. It worked great for our lambs. Only hiccup is that it's white. But a guy can work around that I guess. The sling works as it should however the sling I received was white(I know the description says colors vary). That’s gotta be the worst possible color for this kind of application. 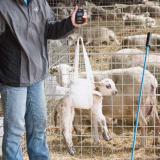 I’ve used the sling 3 or 4 times and it’s already covered in very noticeable dirt, manure and blood stains. Not a huge deal but still disappointed.